June 16, 2016. Much to our dismay, we came back with a surprisingly hefty and undesirable souvenir from our trip to Italy. An extra five pounds each. And this, despite having walked 7 – 12 miles per day, according to our iPhone health trackers. So upon our return to Oslo, we realized we had to go on the austerity plan. No more carbo-loading pasta at every single meal like an Italian. And our exercise routine needed to be stepped up a notch. Time to break out the bicycles. Some of you will remember that Matthew and I have ridden a tandem for many years, with him manning the helm primarily because of my singular lack of ability to master rather vital cycling skills, such as steering, shifting, and using hand-brakes. There’s nothing quite so harrowing for me as plowing alone and uncontrolled through the throngs of charity-fundraising runners, triathalon trainees, clueless sightseers, texting teenagers, churro vendors, baby-strollers, and lapdogs on invisible leashes that are to be found all along Chicago’s Lakefront Path. 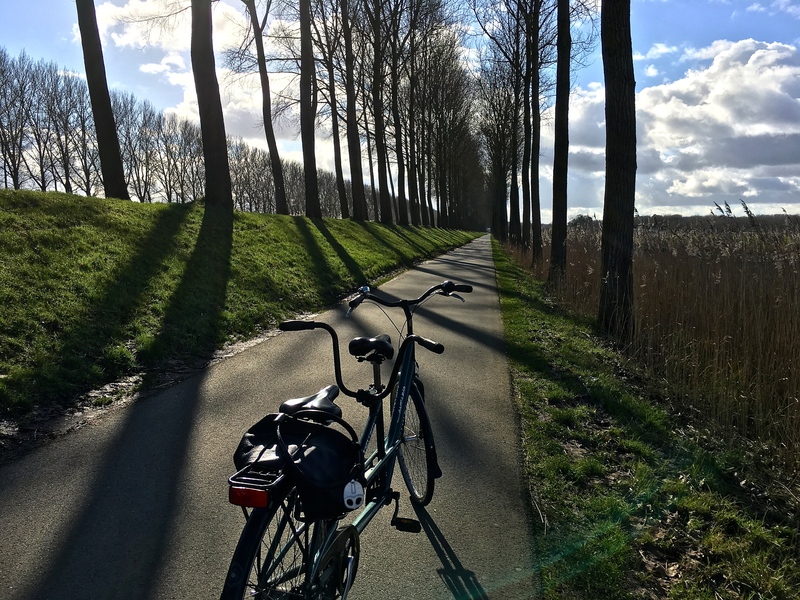 In Belgium, we rented a tandem to bike the peaceful canal pathway into the town of Damme. For safety’s sake — meaning to protect the lives of innocent bystanders as much as my own — I’ve restricted my independent bike riding to the countryside, where nice soft fields and fewer obstacles await. 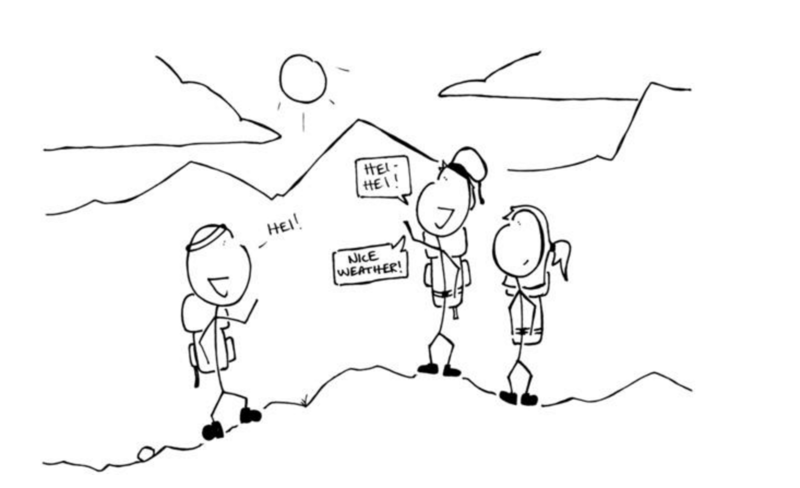 We’ve kept to this strategy while living overseas as much as possible. If we can’t rent a tandem, we go with singles but pick a road less traveled to ensure I don’t cause an international incident by running locals off the road. Americans have enough bad press right now. My little Norwegian-made kid’s bike has a big American name. Acknowledging that solitary cycling seems more socially acceptable, we began our quest to locate two single-seaters. Finding one small enough to fit me proved much easier than expected. We bought a child’s bike for the equivalent of $50 at the flea market. With its seat lowered all the way down, I could just barely touch the ground to catch myself when stopping. But the best part is — it had coaster brakes like those from my childhood and only one shifter with just three gears! Matthew’s search proved a little more lengthy, as he really wanted one of the Dutch models we’d seen in Amsterdam. Those don’t come cheap. After quite a bit of culling through the used bikes advertised on Finn.no (Norway’s answer to Craig’s List), he found a likely candidate for the bargain-basement price of $350. During Matthew’s test ride, the owner confessed to selling it because “its seat squeaks.” But peeking into the guy’s tiny garage and seeing ten other bikes, I’m thinking that his wife had decided it was time to make room for the car. Looks like this woman is headed for the “Malachi Crunch” between a bus and the Trikk. At least she has a helmet. Sometimes during our coffee breaks, we’ll witness so many spectacular falls from folks getting stuck in the Trikk rails that we feel like we should rate each by holding up old-style Olympic scorecards. 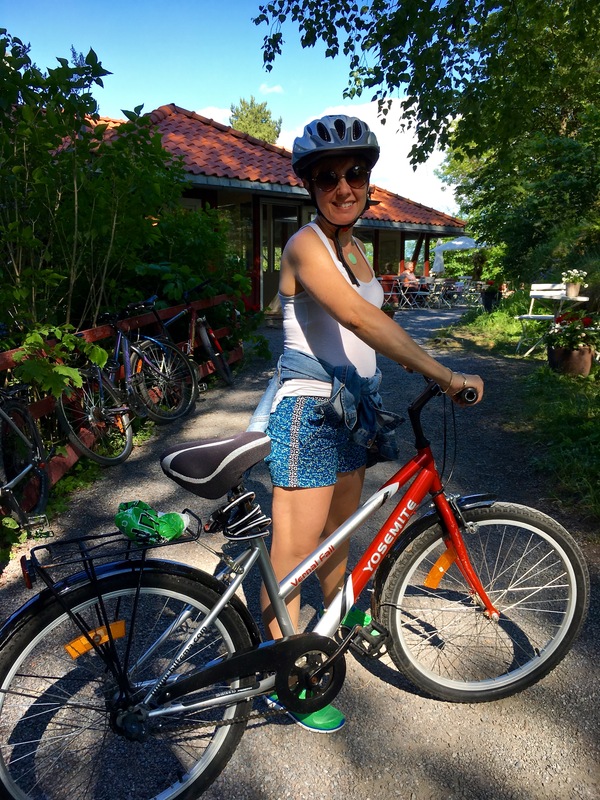 Our first couple of outings on our new steeds made it clear that city riding can be tricky in Oslo. 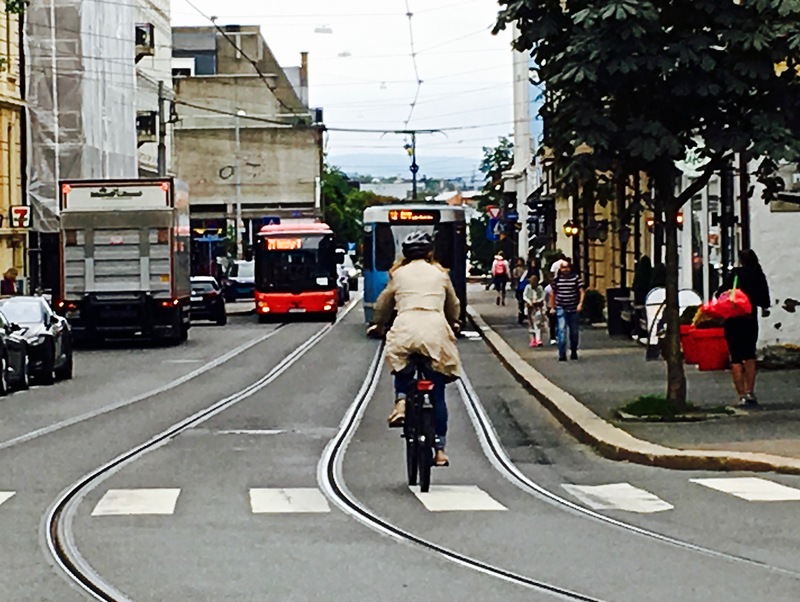 Aside from the painful tenderizing your posterior takes while traveling down cobblestone streets, it’s virtually impossible to avoid getting your tires stuck in the tram tracks and taking a resulting header. We’ve sat corner-side at our favorite coffee shop and counted the number of folks who’ve done a face plant right in front of us when a car unknowingly crowds them into the Trikk rails. Needless to say, I’d advise sticking to side streets whenever possible to avoid these bike traps. Fjord views along the Frognerstranda bike path seem to get better and better with every trip. 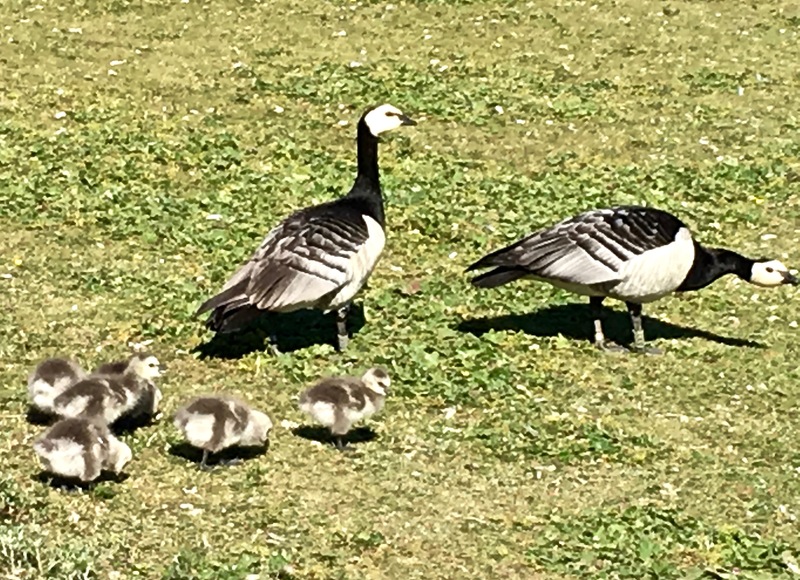 Behold a mama and papa Barnacle Goose (Branta leucopsis) with their adorable puffball babies. So freakin’ cute!!! You’d think it would get boring, but the view is always changing. New wildflowers border the trail each trip; we get to watch the geese families grow up; somebody’s always showing off their new sailboat in the harbor; the King’s farm seems to regularly rotate herds of cattle, sheep, etc. ; and we keep discovering new little cafes along the way — which isn’t doing much to help our dieting issue. Peruse the gallery below and click on the images to learn more about the royal, historic, and natural sights we’ve spied during our cycling …. I have to start with a photo of one of the hills we tackle to get to and from the fjord bike route. It passes over the highway and is suitably steep enough to help us work off some those vacation love handles we’ve acquired. Now here’s something you never see on Chicago’s Lakefront Path — folk practicing their cross-country skiing skills using ski-skates. We’re often astounded at the number of older moms who get in on the skateboard action with their children at the skate park next to the bike route. 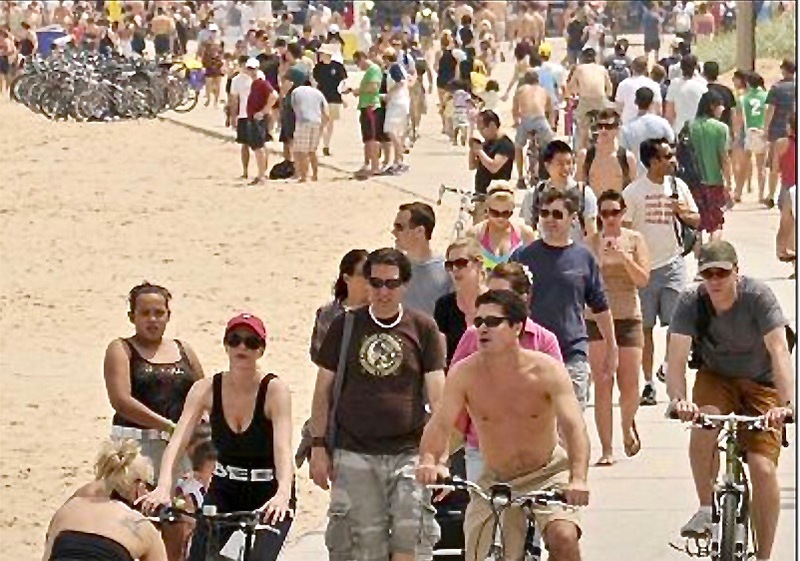 No wonder everyone’s so friggin’ skinny — they’re always on the move. At the end of our ride, we’ll often stop at Kongen Kro (meaning “King’s Bar”) for a burger and beer. To cut calories, we won’t eat the bun, but the frosty mug is non-negotiable. Nothing better than sitting in the sunshine (when you can get it) and watching the various yachts and sailboats come by to gas up. The Kongen Kro’s burgers get cooked in the cute Airstream trailer’s kitchen. And if you really want to feel beachy, you can fight for a seat in the sandbox, complete with fake palm tree. Across from the Kongen Kro is Kongen Rokclub (the King’s Rowing Club). The clubhouse was built in 1925 but the rowing club itself got its start back in 1878. Several members from the club have competed in the Olympics over the years. If you continue along the path to Bygdøy Peninsula, you’ll come to the Bygdø Royal Manor, commonly called “The King’s Farm.” The land has been in continuous use by royals since 1305, when King Haakon V Magnusson gave Bygdøy as a gift to his queen, Eufemia. Today, while the site is officially owned by the government, the farm is run by the Norwegian Folk Museum, which is about a block down the road. The Norwegian Folk Museum operates Bygdø as an organic farm, with 30 sheep, 60 dairy cows, 90 calves, and 9 ponies. Of the farm’s 2,000 acres, 740 are cultivated for livestock fodder. The Folk Museum also uses the farm to teach kids about farming methods and the natural flora and fauna of the area, of which 545 acres are set aside for habitat preservation. One weekend, we came upon a huge group of tents for Norway’s 4-H club. I love the fact that their tents are round lavvus like those that the Sami reindeer-herding people use. Across the street from the barn is the Royal Manor House, where King Harald and Queen Sonja live during the summer. Along the Frognerstranda (Frogner Beach) bike path, you can get a glimpse of Oscarshall, the summer palace of Swedish King Oscar I who ruled Norway when it was a holding of Sweden. 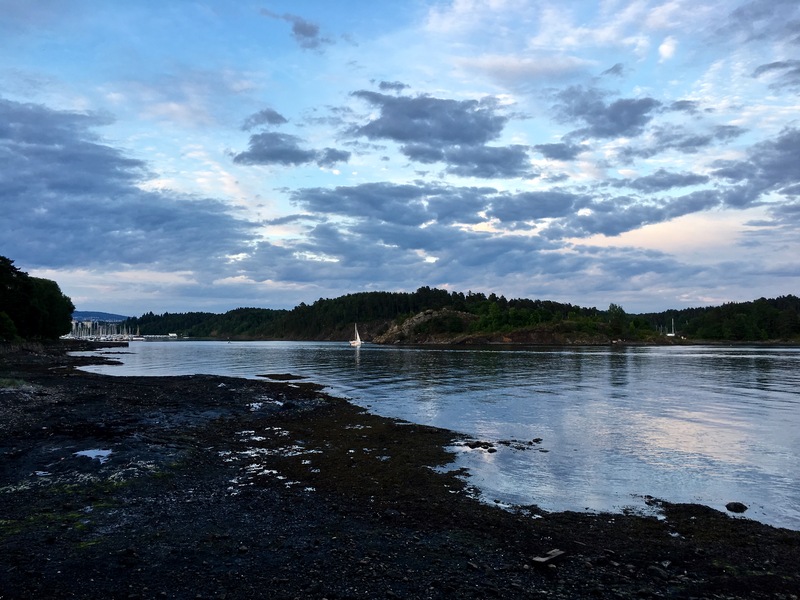 From the garden of Oscarshall, you can get a good view of one of the many nearby marinas along Frognerstranda. It’s said that the king’s sons selected this spot for his summer palace while they were out sailing. Our favorite coffee stop along the way is Rodeløkken Café, which offers pastries, sandwiches, and beer, too. Originally called “Henningslyst” (Henning’s Bright), the place was built in 1780 as a summer cottage for Colonel Henning Hesselberg. For an al fresco dining experience, the cafe offers a series of lovely terraces that overlook the fjord. Matthew’s fall broke the bone in his hand that leads to the pinkie finger. Luckily, he’s a fast healer, and the fracture was small. One final note about our bicycling adventures. They’ll have to be put on hold for awhile, as Matthew has had his first accident. Riding home from work, he pulled into the park and hit a thick spot of gravel. It gripped his front wheel, jerking it sideways, which launched him over the handlebars. End result? 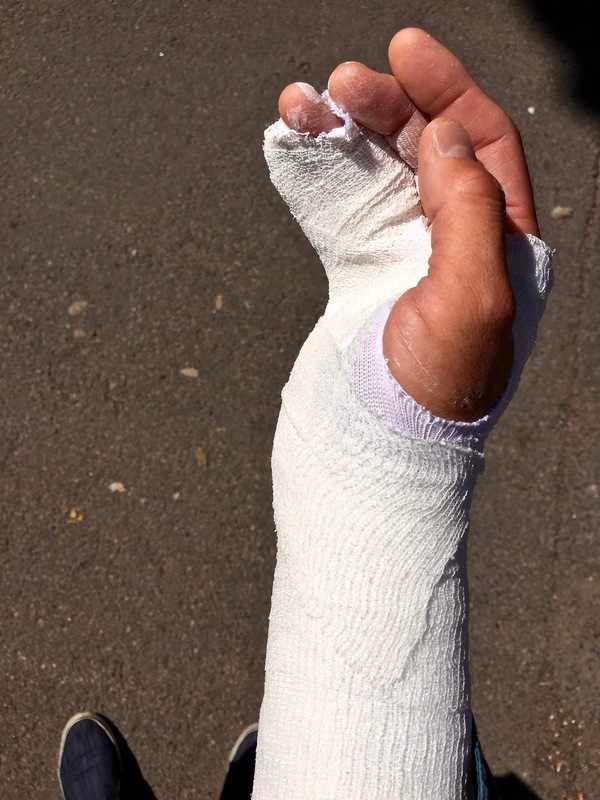 A broken hand, which means no cycling for a least a month. Guess we’ll have to pull out those running shoes again. And as a eulogy to our bike riding days, I thought I’d create a little gallery of the sunsets we’ve been privileged to witness during our rides. Check out those incredible clouds. They look like something out of an apocalyptic movie, or Edvard Munch’s “The Scream.” Yep, he was Norwegian. Look closely, and you’ll see a little fleet of sailboats made up of new learners. Sailing classes are regularly taught in school. You can also see a crew rowing a shell in the foreground. Owning a boat is every Norwegian’s goal. When you can enjoy sunsets like this from the deck of your own ship while you’re out at sea, I can understand why.